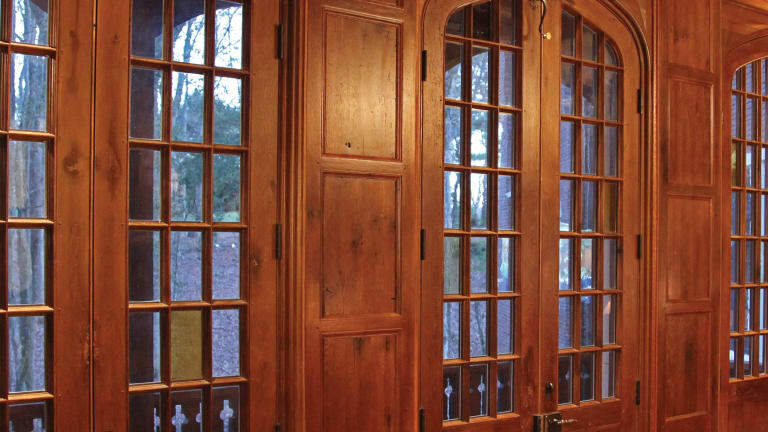 Hull Historical Millwork puts the finishing touches on an English Revival house's Tudor style woodwork. When it comes to making interior woodwork, one the high points of the craft is the rich, intricate, oak matrix of Tudor wall paneling. The fruit of sophisticated frame-and-panel joinery techniques developed in 17th-century England, Tudor paneling was all but overlooked in America until the 1890s and 1910s, when it was rediscovered as the ideal, non-Georgian wall treatment for houses in the Arts & Crafts and English revival styles. 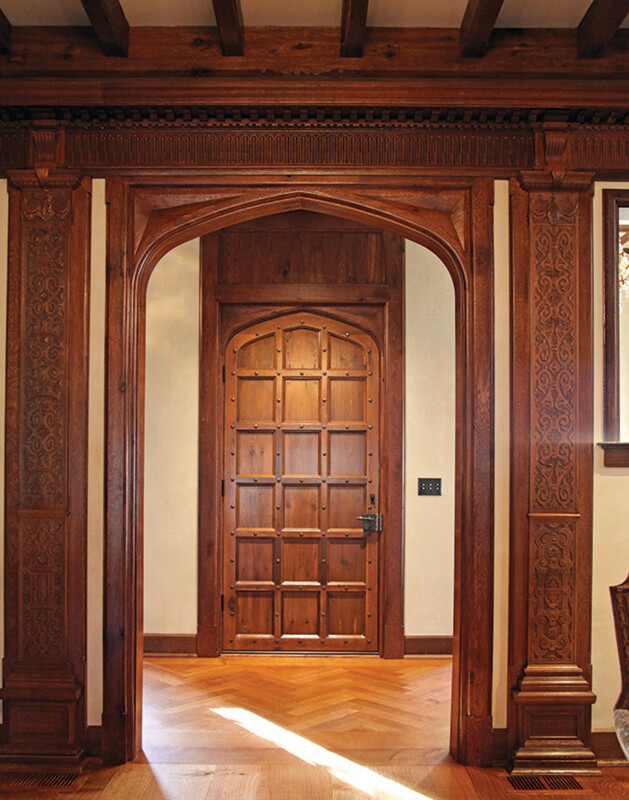 By then the complex grids and joints could be readily re-created with modern millwork machinery, and that’s just what Hull Historical Architectural Millwork of Fort Worth, TX, found when the company was asked to emulate a landmark Tudor Revival interior in a new period house. The project, which began in 2007 as the completion of an English Revival house in South Carolina, quickly became a trip back in time. 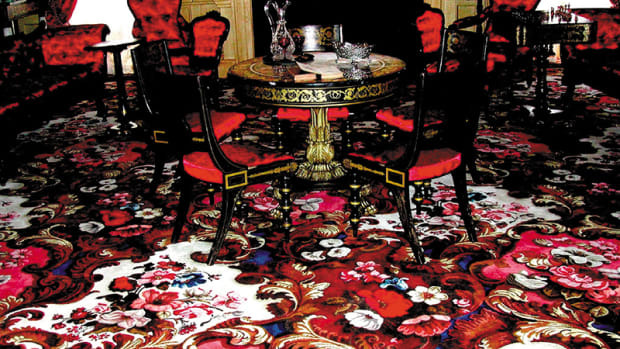 “We got a call from an architect who said he had a client who wanted to add some very ornate interior woodwork designed after Stan Hywet in Akron, Ohio,” says Hull Historical president Brent Hull. Not a person but a house, Stan Hywet is one of the largest and most elaborate examples of Tudor Revival architecture in America. The 65-room mansion was built in 1913 by Frank A. Seiberling, the founder of Goodyear Tire and Rubber, and is based upon several 15th- and 16th-century English manor houses. Though designed with modern amenities, such as central heating (which is carefully hidden), the mansion is a showcase of medieval-style ornate plaster ceilings and wooden wall paneling and carvings. The woodwork had been done by Huber & Co. of New York City and Rochester, a prominent interior design and fabrication firm of the day. White oak is the iconic species for Tudor woodwork, due to its strength and ability to produce a fine, even chocolaty finish. Note the curved panels in the ceiling of the arched hallway. In the course of doing the lion’s share of the woodwork in the 6,000-sq.ft. 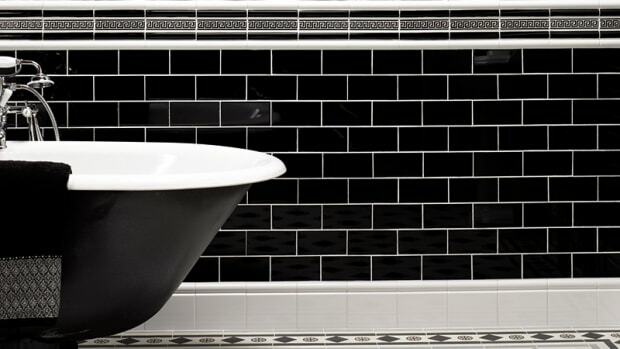 house – from doors and wall treatments to kitchens and ceiling beams – Hull Historical also lent a hand as de facto design consultants. 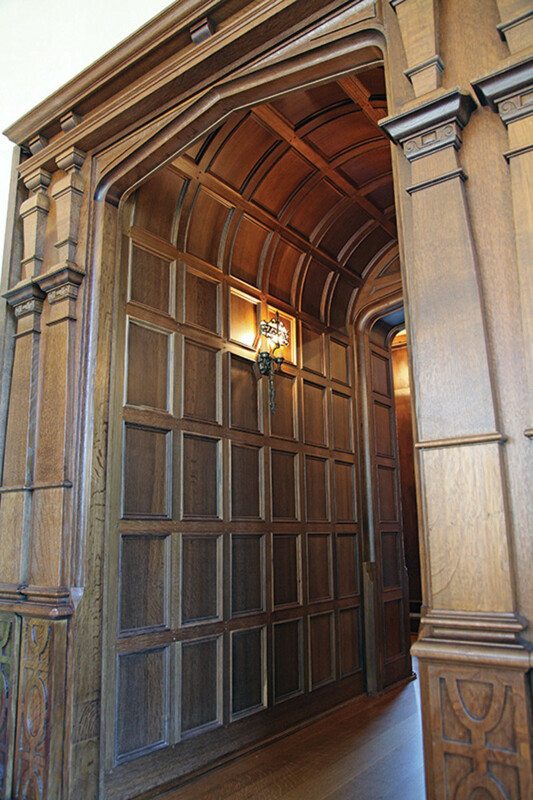 “The combination of the Stan Hywet paneling and the Woodbine paneling, which we reconfigured and installed in the basement, is what drove a lot of the design,” says Hull. “In essence, we tried to create a kind of millwork hierarchy within the areas of the house.” As a result, the basement has a more rustic appearance, with repurposed board-and-batten doors and simple moldings. On the main floor, the paneling is more refined, with the most formal features in the main living room, study and library. Then, on the second floor, where the lady of the house wanted the master bedroom in a French style, Hull Historical switched to Classical-style treatments with large panels and bold moldings. It should come as no surprise, then, that the folks at Hull Historical are purists. He notes that, on this job, about half the woodwork is made with true, pegged, mortise-and-tenon joints. Where that construction didn’t make sense – say, due to the limitations of space behind the wall or the nature of the trim – they built the panels with thinner-than-traditional dimensions and used pocket screws to hold the frame together. “Right now, we’re using at least three details we’ve picked up from historic drawings, but that no one else is doing – that is, I have yet to see anybody else doing them,” says Hull. Hull Historical doesn’t use CNC (computer numerical control) machines or other automated tools, and keeps one full-time carver on staff. “There’s a lot of crude carving out there, but these days it’s a challenge to find people that can really do true traditional carving, such as for the thin, interweaving bands of English strapwork ornament,” says Hull. 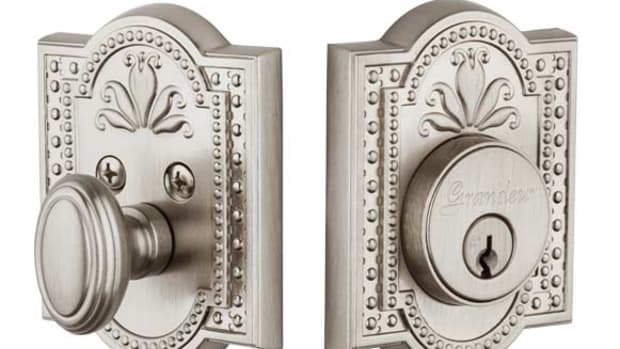 On this project, carving appears in the door headers, which are decorated with faces, as well as in the strapwork at the tops of paneled walls or in the spandrels above the door openings. 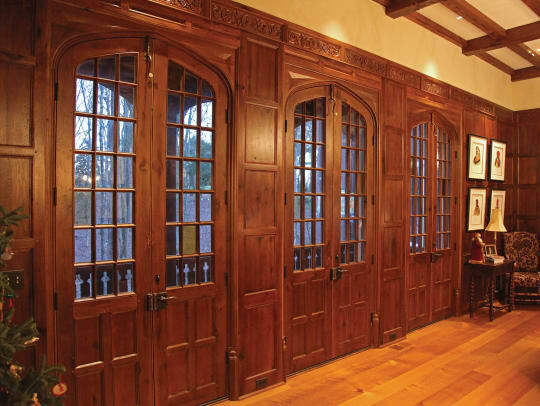 Since the Tudor paneling in this job is all white oak – a mix of about 10 percent old and 90 percent new millwork – it’s logical to wonder what stock Hull Historical chose. “I feel pretty strongly that it’s hard to match the tight grain of old growth oak – it just reads as a much richer, finer material,” says Hull. 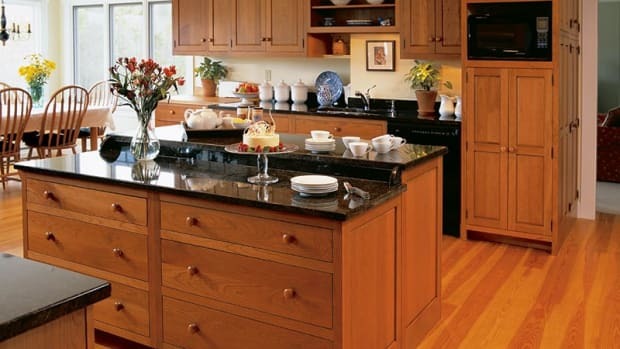 With antique material, Hull is usually more concerned with avoiding defects like nail holes and mortise joints than selecting for grain, as much of the antique oak they use is salvaged from the beams of demolished buildings. Some is sawn from old-growth trees that come down due to age or being in the path of real estate development, but those are much harder to find. The big four woods they use most are antique oak, Eastern white pine, longleaf pine and cypress, with an occasional call for antique fir.